I grew up as an only child with an Irish father full of tales from Ireland and Scotland where he grew up. My mother supplied me with every nursery rhyme ever written and chicken every Sunday. I knew early on I wanted to be an artist, whatever that would mean. Books of fairy tales and far away places filled my head and became the beginnings of my career of 33 years of telling stories with my art. This painting is truly a story about my life. First of all, I love to paint and love to cook. I sometimes wonder if I could have been a better chef than a painter. 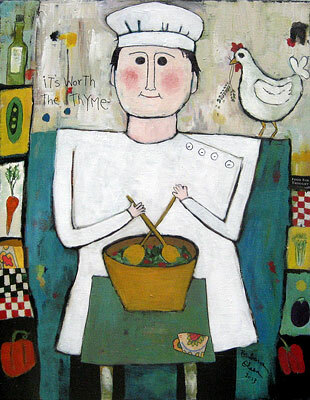 It is interesting to me and perhaps you will see chickens often appear in my work as they do in this painting. Fresh food is another ingredient that I show, as growing up in California we always had fresh fruit and vegetables. My mother always had a garden and my grandparents farmed. I see herbs and olive oil and whoops, I must have been drinking the wine since I forgot to put it in the painting! Next is color and texture, all very important for me as the childlike or primitive feeling is also my look. I dig deep for the child that lives within, as the world around us can often take away the innocence of childhood and the imperfections that are real. My greatest gift is to make people smile.